As of this writing, I have owned the Epson 4800 printer for just over one week. In this time I have printed several comparative test prints against my current standard photo printer, the Epson 9600. What follows are some of my thoughts about this printer to date, as well as a few tips on using it. All my comments relate to using my own custom paper profiles (made with the Gretag Eye-One profiling tool) using only the PK (Photo Black) ink in both the 4800 and the 9600. I have not yet tested MK (Matte Black) ink in the 4800. While my favorite paper to print on is Epson's Premium Semimatte, I compared many of the test prints on Epson Premium Glossy since it tends to show specific flaws more readily, as well as Epson's Premium Luster since it has historically given me a broader color gamut with the 9600's UC (Ultra-Chrome) inks. Unfortunately there is no way to show the specific differences I discuss on the web, so I'll do my best to describe these differences verbally. The answer requires some background on how (and what) I print. For photographic images I prefer 'traditional' photo surfaces on my papers to either matte fine-art papers or alternative printing materials like canvas. Additionally, I don't particularly care for the 'candy' gloss one gets from the really high-gloss resin-coated papers like Fuji Crystal Archive. Call me old-school, but I simply prefer the look of a traditional air-dried 'glossy' or 'semimatte' fiber-based paper surface. Depth of the blacks on these surfaces was greatly improved for digital imaging when Epson released their UC inks a few years back, however they were still a step behind traditional wet-process blacks. Regardless, I felt they were good enough and had a significant enough convenience advantage over the traditional wet process that I finally took the leap and transitioned from traditional wet prints to ink-jet prints. Three years later, enter the new K3 inks from Epson and their claimed increased black performance, and my interest was further piqued. In discussions with other imaging professionals who had seen prints on surfaced papers off these new printers, it was confirmed that the improvement in blacks was both real and fairly significant. When I finally saw some prints first-hand, I agreed with their assessment and decided it was time for me to upgrade. This left the issue of size. Most that know me, also know I have an Epson 9600 and like to print large. So why would I be attracted to a 'small' format printer like the 4800? When Epson announced the new K3 inks, they also announced they were shipping the new 13" 2400 and tabloid-size 4800 printers immediately, while the larger-format 24" 7800 and 44" 9800 printer shipments would begin later this fall (2005). So I ordered a 2400 from my dealer to get a jump on the new inks and see how improved they really were in day-to-day use figuring I'd be primed when the larger printers finally shipped. As it turned out, my dealer got in a surplus of 4800's before their first 2400 arrived - and I am impatient - so I joke that I 'settled' for the 4800. The whole truth is I normally print 16x prints for framing and less frequently will print 20x or 24x prints. While I have printed a few 32x prints, they are a pain to handle, mount and frame so I basically gave up on those sizes after the first few. Hence my ideal printer would handle 24", but I figured the tabloid-sized 4800 printer will suffice for the interim until the 7800 is available - that plus it has the added advantage of the multi-sheet feed tray, so my decision to spring for it was made. Tonality. I see a definite improvement in both the blacks and the highlights with the new K3 ink. Blacks are indeed blacker and grays have more detail into the highest highlights than they do with UC inks. With my 9600 when I get below about 15/15/15 the blacks do not get any blacker, however with the 4800 this doesn't happen until 5/5/5 - a significant improvement in black. In highlights with the 9600 I get up to 252/252/252 before I cannot distinguish paper white, while with the 4800 I can differentiate between 254/254/254 and the full paper white of 255/255/255. Not as significant as the gain was in the blacks, but nonetheless a notable improvement. Where my 9600's UC inks show some significant GD in the blacks, it is only visible in the deepest shadows with the K3 inks. With Epson Premium Glossy paper, GD shows up at around 30/30/30 on my 9600 and is a significant transition from a glossy to a flatter, less reflective black. On the 4800 it does not show until around 10/10/10 and is more subtle, where the blacks actually get a slight bit glossier. In the highlights on the 9600 I can detect the GD in any highlight area where ink is actually deposited when comparing to the glossy paper surface. With the 4800 this problem is virtually eliminated. The ink has slightly more gloss than the paper so it is difficult to detect the differential - and when you finally do, you need to have a fairly hard edge of gray against the paper white to see it. In other words, I cannot detect it unless I have a gray of around 245/245/245 or darker directly against paper white. To a certain degree, the GD still shows up on surfaced papers with the 9600, but on the 4800 is a non-issue with any of the textured surface papers like Epson Premium Semimatte, Premium Semigloss or Luster in either the shadows or the highlights. Frankly, it is so subtle on Glossy as to be a non-issue for me, but I respect it may be an issue for super-critical viewers. Bronzing is a significant, but not overly objectionable issue with the 9600 and surfaced papers. Moreover, bronzing will likely remain a fact of life with pigment inks due to the metals used in their composition, where dye-based inks don't need them. (While I do not know the exact composition of Epson's inks, I am told the most common metals used in pigment inks are hexavalent chromium, barium, cadmium, antimony and selenium.) Fortunately, bronzing can be almost totally hidden by mounting a surfaced print under glass or plexi. In fact this was Epson's thinking with the R-series printers and their gloss-optimizer coating, and as we all know it works very well. To my surprise, the new K3 inks are even better than the coated UC inks of the R-series printers! In direct comparisons between prints from an R1800 and the 4800, the 4800's K3 inks show less bronzing than the coated UC inks of the R1800, and of course significantly less bronzing than prints from the uncoated UC inks used in the 9600. Bronzing with the 4800 is still present, but very subtle and only visible at improbable viewing angles. In fact I will go on record saying bronzing has now reached the point where for all practical purposes it is a non-issue even on a naked print. Colors from the 4800 remain vibrant and the added black makes them pop even more. It gives the overall impression of perhaps increased contrast, but in reality it is simply more DR (Dynamic Range) and a broader color gamut than I get from the 9600. Not that I consider the 9600 colors to be bad, but by comparison the 4800's are clearly better. Enough said. Having the ability to tray feed large sheets is new to me and frankly a welcomed addition. Anyone who has used a 7600 or 9600 with sheets knows what a pain manually feeding single sheets can be if you have a significant volume of prints to produce. The 4800's paper tray takes care of this automatically with paper sizes up to 17" x 22". Another advantage to using sheets is that they do not need to be flattened out before mounting - an added benefit when one is under time constraints producing a quantity of images for a show. While not crucial to my uses, the 4800 is about twice as fast as my 9600. It prints a full 16" x 20" print in less than 5 minutes on the single-pass or low-speed mode. This is over twice as fast as my 9600 can do. If I check the high-speed option in the driver, the print speed gets cut by almost half. I typically never use high-speed mode on my 9600 since the print quality is visibly better with it left off. While I still keep it off on the 4800, truthfully I cannot really see any difference in print quality compared to when it is turned on. Maybe I'll get brave one of these days - or behind - and leave it switched on for my fine-art prints. All I can say here is, "Wow!" Black and white prints off of the 4800 are simply stunning and this is on the surfaced papers, including glossy. I get full, rich blacks, and lots of detail in both the shadows and highlights. Additionally, Epson included a superb B&W toning control. 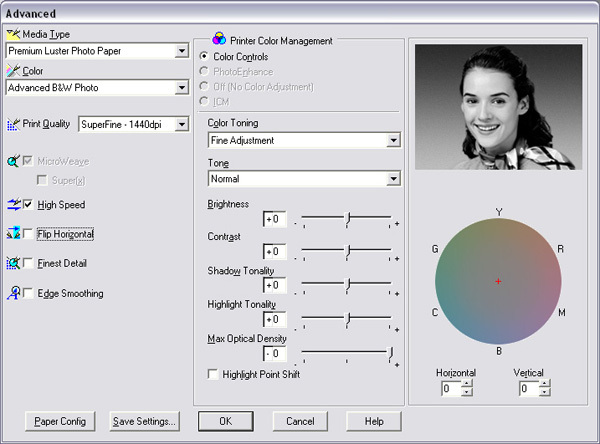 This tool lets you add warmth or cool down the tone of the print, in effect allowing you to digitally emulate traditional B&W paper base whites and platinum-toned or selenium-toned looks. While the overall tonal range is perhaps not as broad as traditional wet process black and white on surfaced papers, it is very, very close - close enough that I predict many B&W aficionados will be abandoning their chemicals for this printer. I have heard a few complaints about excessive ink usage in the 4800. 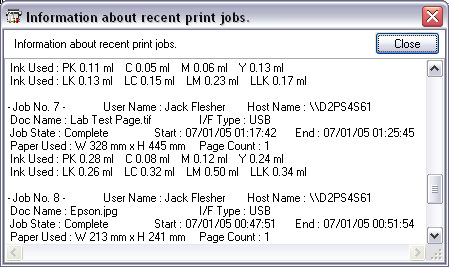 There is a nifty 'Printer Information' menu buried in the print utility, under the Epson LFP Remote Panel's Media Adjustment menu that shows stats for recent jobs you've printed. In the following screenshot for a print of Bill Atkinson's 'LAB' test image you can see the information it generates. If I add the individual totals for each ink, I calculate the 4800 consumed about 2.14ml of ink to print that 35.05cm x 44.2cm print. I'm not sure how accurate the ink consumption values are, but using them and the image size, I calculate this translates to an ink consumption rate of about 13.8 ml per square meter, or 3 ml per square foot of print. While I never calculated consumption that closely on my 9600, this figure is actually slightly lower than what I've heard quoted by other Epson UC LF printer users. I think it is at least safe to say that ink consumption appears comparable to the previous generation of printers. While I like this printer a lot, it is not perfect and has a few flaws - flaws that could have been avoided if Epson had taken the time to do it right. Simply stated, even with the operational shortcomings listed above, I really like the images this printer produces. A lot. In fact I am so enamored with the performance of the new inks on color as well as the huge improvement for black and white prints, that I have already sold my 9600 to make room for the 7800 when it finally ships. 1) Glossy paper feeds just fine from the tray - at least on my printer. Hence you can build your own custom profile while using the semigloss paper setting. In this fashion you can simply tell the Epson driver you're printing on semigloss while using your glossy paper profile, and the printer will happily feed the glossy sheets from the tray automatically just as though they were semigloss sheets while your paper profile lays down the ink properly for the glossy paper you're actually feeding. 2) The other method is to load a stack of glossy in the paper tray and feed it manually by pressing the "/\" button on the printer. This is still a manual process and you need to press the "/\" button to load a sheet before printing each image, but at least it feeds the sheets directly from the tray and does not require you to go through the cumbersome front loading process for each sheet per the Epson instructions. Epson posted as of 7/7/2005 a new firmware that fixes the feeding issues with glossy papers. I have been printing on my spanking brand new Epson 4800 for the past week after having previously owned a 4000, although the 4000 is a good printer, I think the 4800 raises the bar another notch in regards to print quality especially with black and white prints. Mostly I print my black and white images on fine art paper, such as Epson Ultrasmooth or Somerset Velvet. I thought perhaps others would be interested in the results of a mini survey of prints that I had made from each printer. I took one of my favourite landscape images , ( http://www.garynylander.com , the mountain and lake image when the curser is over "landscapes" ) and printed a 10 x 12 inch grayscale image on on a piece of 11 x 17 inch Somerset Velvet paper from my-soon-to-be-gone 4000 using the stock Epson driver and the same image on the same paper, same size on the newly-acquired 4800 using the Advanced Black and White print option, ( using the neutral setting ). I showed these two prints to various friends, family, co-workers and asked them to pick which print they liked better, not telling them what print came from which printer, out of the twenty-four people who looked at the prints , twenty-two choose the 4800 print over the 4000 print, mostly I was interested in see what people would say who are not photographers, one person who looked at the two prints said that the 4800 print "looks more black and white". I also rummaged around the house and found a print I had made using the QuadTone RIP software with the departed 4000, I made a print of the same image on the same paper ( Moab Entrada bright white ) with the 4800 again using the shiny new 4800, I showed these prints to a friend and his wife and who both liked the 4800 print over the QuadTone Rip print from the 4000, they could clearly see a difference. To my eyes, looking at the prints from the 4800 ( using the advanced B/W option ) the prints have better blacks, show a better tonal range, especially in the mid tones where there is better separation and no metamerism ( at least that I can see ) , with the QuadTone RIP images I prefer the prints from 4800 because it has a smoother appearance, has a better tonal range, both are close in terms of neutrality , also the Quad-4000 print has a more "dotty" look to it ( in the sky areas ), all in all I think the 4800 is an awesome printer which I hope to keep longer than the one year that I owned the 4000 ! I should mention that I don't own Imageprint software so can't give any comparisons in that regard, as its a tad expensive in Canada here." "Having just returned from a two-week trip, I powered up the 4800 to make a few test prints from the trip. The printer generated a greeting that asked if I wanted to do a power-cleaning routine. Apparently it knew I had been gone for a while. Being thrifty, I of course declined so as not to waste ink needlessly. After all, what could have gone bad in two weeks of non-use? I printed my test print, and all looked good except a small area near the end of the 16" print. Bummer. I did a regular head cleaning, printed the nozzle check and had broken lines. Double bummer. Now realizing I should have taken the printer up on its initial offer, I performed the power clean. Since you need to man the printer and flip levers to do this, I was standing at the printer and noticed that the yellow ink tube (it's on top and easily visible) had a *HUGE* air bubble in it and was the obvious cause of the printing problem. However the air got into the lines in the first place, the power clean rectified it and all is back to normal. I suspect it may be possible it was due to the fact I had turned the power to the printer off in my absence. Or perhaps air can simply leak in at the cartridges during extended periods of non-use, though this seems like an obvious design flaw if it is the case. I will leave the power on next time I am gone for a week or more and see if the problem resurfaces. For now I'll simply recommend that if the printer suggests a power cleaning, take it up on its offer... "
"I spoke to Epson support today regarding the MNT REQ 0088 my 4800 has been displaying for the last few days (along with persistent requests for a power clean). Apparently it's the first maintenance code call Epson here have had for the 4800. The solution is to reset the clock, either via the printer controls or using the LFP remote panel. I've done that this morning. If the problem persists the next step is to have the clock battery replaced. I also asked him about whether it's best to leave the printer off or on - Epson's recommendation is the printer is left off when not in use so the head is capped. Regarding bubbles in the lines he mentioned changes to the 4800 ink tanks should address the bubble problems with the 4000. Finally he said leaving the printer off for 1-2 weeks shouldn't cause any problems, but also said if you're not printing anything for extended periods (weeks) turning the printer on every now and then and letting it cycle through to Ready is a good move. I posted a few more notes at http://www.magicpixel.com.au/epson4800blog/. I'll see what happens tomorrow re the 0088, either way it's more of a minor hassle than anything at this stage, the prints are coming out fine." 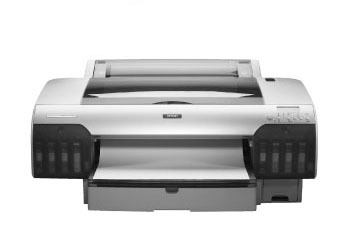 Note: We will feature the Epson 4800 in our summit and the GetDPI.com workshops.